I live in Canada. I have a taco addiction. That’s a bit of a problem. There are no taco trucks here. No mom and pop taquerias. There are a couple of places doing great tacos in town but there are lineups. For tacos. That’s why I make my own. Loaded carnitas tacos are how I get my taco fix at home. And you can too. 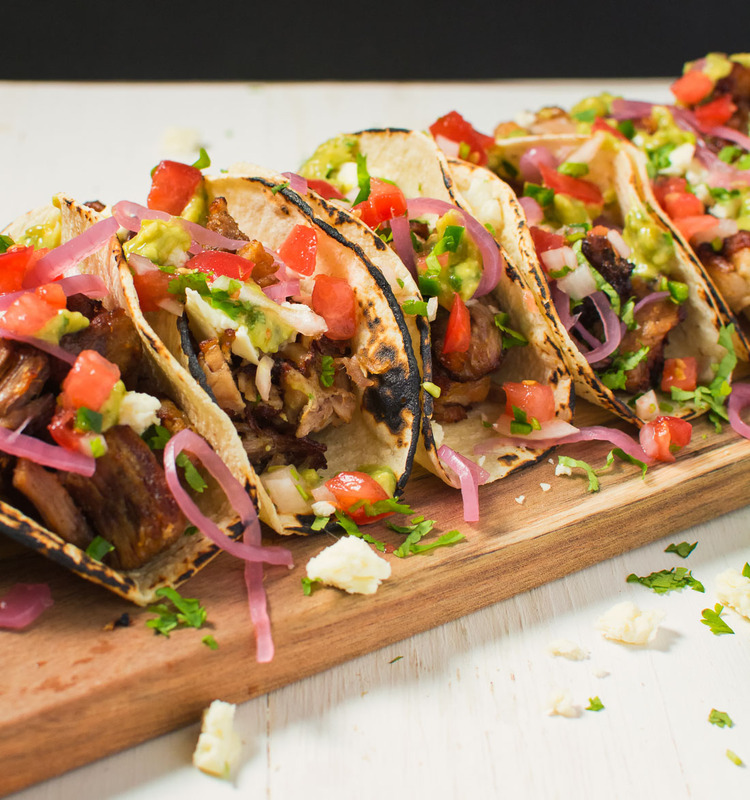 Carnitas are the star of this particular taco. 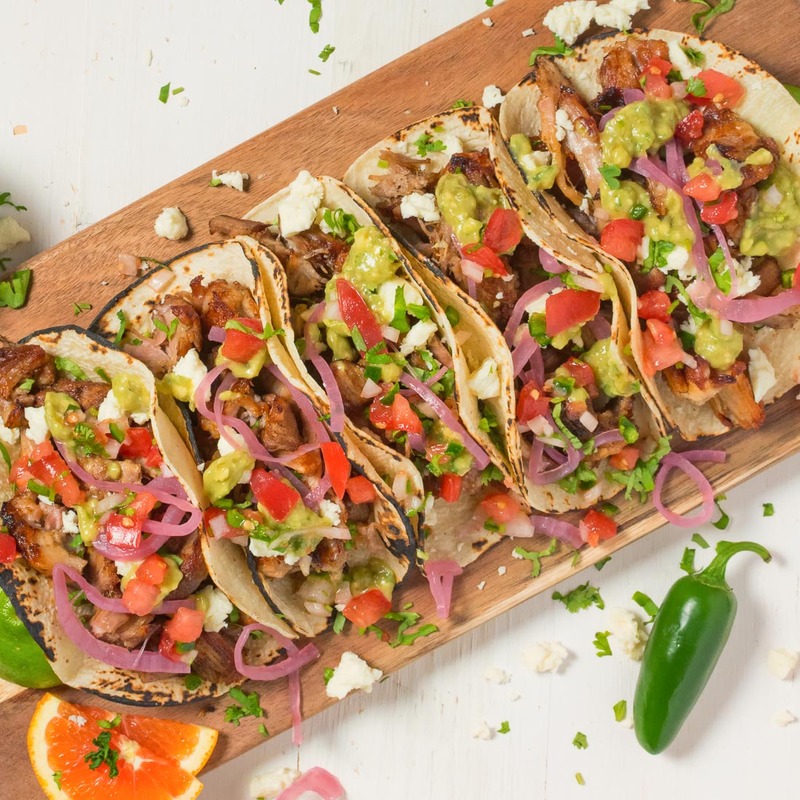 Lousy carnitas – lousy tacos. Well, that’s not the only place to fall down with tacos. Lousy tortillas – lousy tacos. But let’s not get distracted. I make carnitas a couple different ways. Sous-vide carnitas are really good. Make them ahead of time and just fry them up to order. Or you can go old-school and make more traditional pork carnitas. They are really, really good too. Once you have your carnitas sorted out and you have some decent corn tortillas it’s time to turn to the filling. I like a few garnishes in these loaded carnitas tacos. Pickled onions – check. Queso fresco – check. Home made pico – check. And avocado tomatillo salsa. That’s a great salsa for pork. Avocado tomatillo salsa is a nice addition to loaded carnitas tacos but it’s great on burgers and sandwiches too. Boil 2 or 3 tomatillos with a bit of jalapeño and a clove of garlic. Drain, toss it in a food processor with an avocado and a big handful of cilantro. Blitz it all together. Add salt to taste. And the cool thing is it doesn’t turn brown in no time like guac. It lasts hours. A day or more even. Then all that’s left it to build them. A tortilla, some carnitas and then the toppings you love. It’s how I deal with my addiction. You can too. Loaded carnitas tacos make a delicious and really quick weeknight meal. Just make sure you make the carnitas on the weekend so they're ready when you need them. Cover the tomatillos, jalapeño and garlic with water in a small saucepan. Bring to a simmer and cook until the tomatillos darken, about 15 minutes. Combine the tomatillos, jalapeño, garlic, avocado and cilantro in a food processor and pulse until smooth. Wrap the corn tortillas in a clean dish cloth, dampen the cloth slightly and microwave until hot. Top tortillas with carnitas and top with the garnishes of your choice. The carnitas take time to prepare. Make sure you allow for it. Read the recipes before you plan your meal. These toppings are unreal! Love the idea of the avocado tomatilla salsa! It sounds like a total flavorgasm. Now, I know what toppings to use when I make your pork carnitas! 😉 Thanks! The avocado tomatillo salsa is really good with just about anything Mexican. Super versatile and not too much work to make. Hope you like it and the carnitas. These look so good, and authentic! I love your tomatillo salsa recipe – I’m going to save that! Neena – if you can get tomatillos easily that salsa is a nice change and for some reason it keeps way better than guacamole (doesn’t go brown in 2 seconds). Damn these look good! I love charring tortillas…total game changer! Thank for sharing, Romain! 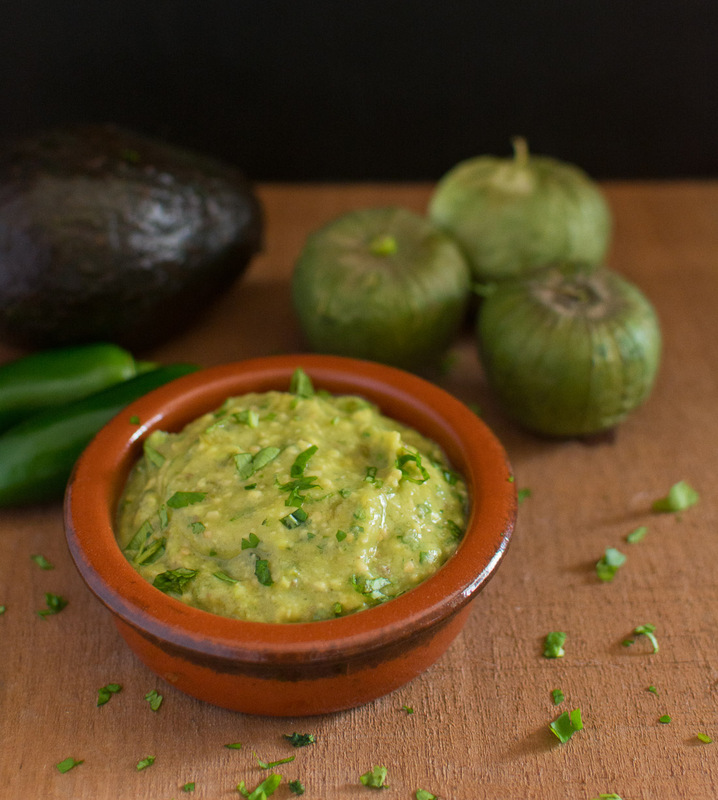 That avocado/tomatillo salsa looks fantastic! Just enough tartness from the tomatillo, spice from the jalepenos, and cooling from the avocado. I think I’m going to use that on a lot of different things!! The avocado adds a nice creaminess as well and balances the acid from tomatillos. Yesssss! Taco lovers unite! David and I do Taco Tuesday every week and I LOVE the look of this avocado tomatillo salsa! Have you tried roasting the tomatillos before using them? It’s one of my favorite flavors and I can’t wait to give this a try with our tacos this week! I do roast tomatillos in other dishes but I’ve never tried it with this salsa. Usually when I roast the tomatillos I also roast the chilies, garlic and onion as well but I see no reason why it wouldn’t work here. No taco is complete without avocado IMO, and your tomatillo salsa is genius for rectifying the brown guac problem! I don’t know about genius but it’s tasty and doesn’t go brown!